Req 1: Currently there is previous / next codepoint buttons for uxxxx-y and koseki-xxxxxx. Is it possible to specify which sequences to show the prev/next buttons, in a way similar to GlyphWiki:グリフの説明? The main use case is the previous mentioned h-propose-uxxxx, it would be much easier to navigate if there were link for the previous and next character. For now maybe just assume that all characters are sequential in order. Req 2: It would be better if the suffix (e.g. hen-ka deformation, locale can be preserved in the links), i.e. in u4e00-t next button will be u4e01-t instead of u4e01. Req 3: For the glyphs that do not exist in the Unicode Multi-column Chart, e.g. u200b8-t, is it possible to show a warning at the top of the page? I think I would be better to place the boxes in a <table> so "previous code point", "browser view" and "next code point" line up. Also, in that case, maybe having them in fixed table cell would be better. An empty cell would be inserted if that country did not have source reference. The order may be better if it follow the Unicode Chart order i.e. GHTJKV. For now, no KP glyph exists in the code chart, so maybe it can be ommitted. For Extension B, there should be an -i glyph. Also for characters with no Japanese source, there should also be a -jv glyph. A design suggestion is available at http://hovertravel.byethost17.com/glyphwiki-suggest-1.png . small triangle in lower left hand corner of 豎折 u31d7, similar to chanhenryfaihang_stroke-szh. small triangle on the top of (non-composite) 捺 u31cf, similar to chanhenryfaihang_stroke-n.
Also, I suggest the thickening of the top 捺 of 橫捺 u4e41, similar to chanhenryfaihang_stroke-hn, which is component of u4eaa, as current form looks like disjointed strokes. For the second one, this style is also G-glyph only, which I would like to be able to faithfully reproduce, for reason above as well. For the third one, the thickening of the stroke is required to accurately reproduce the form for T-glyph and H-glyph. FYI, current "Lower Left G/T" is more similar to T-glyph in Unicode. To reproduce H-glyph, one can use "Connect (H)" for the end shape of the downward stroke instead. Only G-glyph style cannot be accurately reproduced. It is welcome if "Lower Right T/H" could be implemented directly. 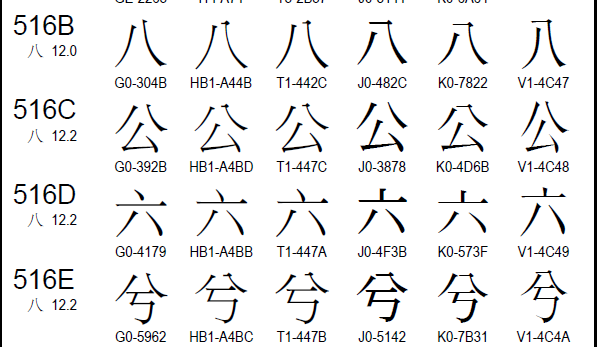 I am not sure if I misread the translation, but I think it is better if the same glyph can use any of these end shape designs, as it will be hard to auto-detect a "Japan Design Set" or "Hong Kong Design Set" for user owned glyphs. Vietnam Glyph may choose to have some of these special feature too... I think not necessary to distinguish between "design" and "shape", it is hard to draw the line for international use. For the proposed "Lower Left G" and "Lower Right H/T", I suggest these be implemented as a start/end on the horizontal stroke. The vertical stroke can choose to use "Connect (H)", that should simplify implementation. For example, for "Lower Left G" the new polygon only depends primarily on the angle of the horizontal stroke. Also for "Lower Right H/T", the shape can be easily constructed by extending the y-coordinate of the existing polygon. Hope this can help! i also suggest to add "half-thickness beginning" and "half-thickness beginning with small triangle". note that 癶登發 has no triangle. 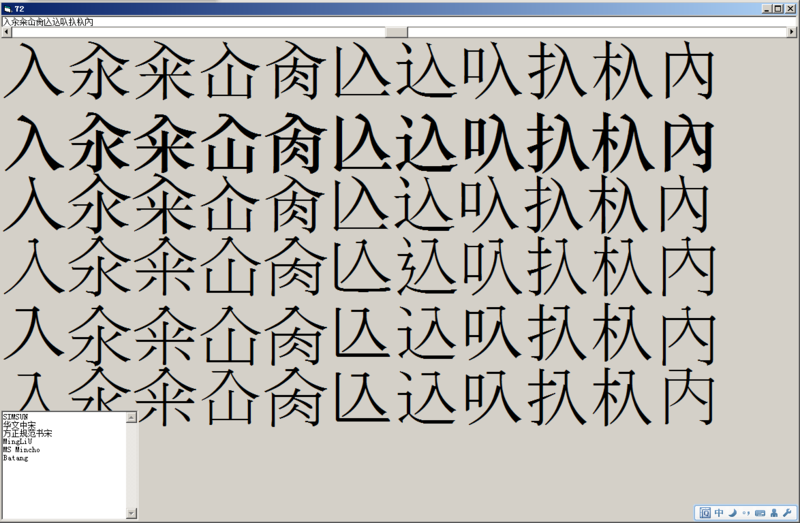 they're unified in most chinese 宋体 fonts, including ucs (see http://i.imgur.com/TqyZ8b7.png http://i.imgur.com/1g0hwqH.png http://i.imgur.com/vXap6yh.png . also note the 兪's long triangle). 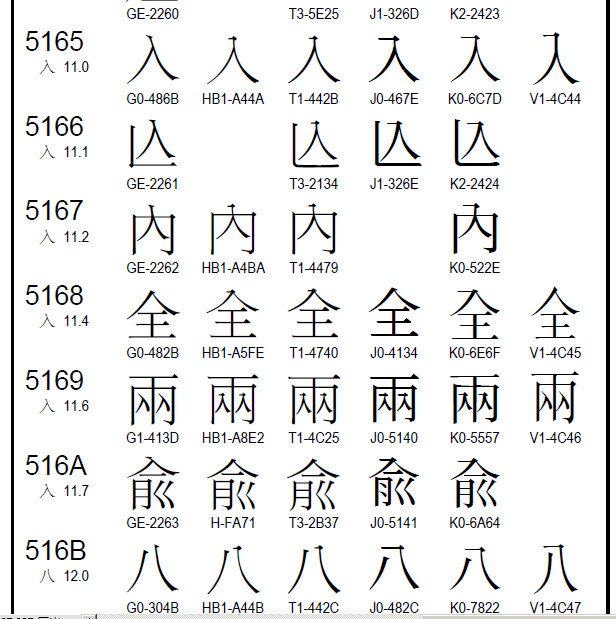 in fact there are following types of 入 implemented in china: "点捺" u5165-var-002 (like u5165-g but inexactly) with half-thickness beginning, full-half-full thickness like u5165-var-001, and half-thickness beginning with small triangle (as in ucs); also "捺" half thickness beginning with triangle (like u5165-g@1 but inexactly). 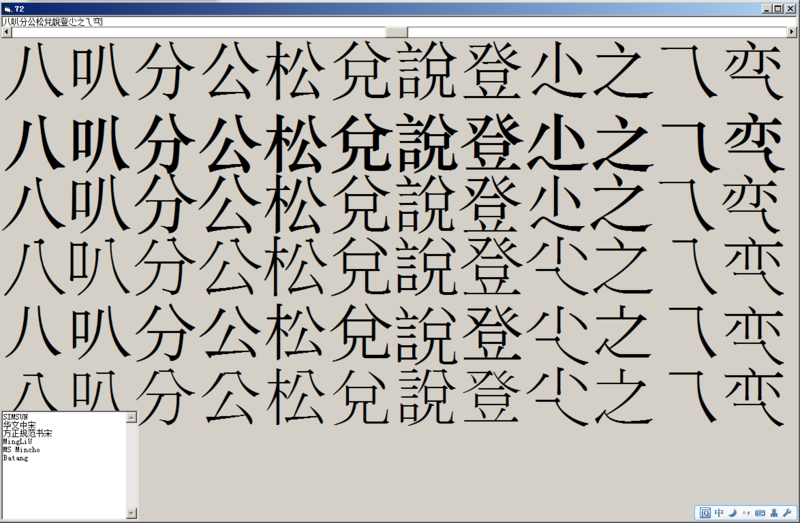 none of them begins with "细入り". but ucs seemed to always use with-triangle 入.
also, just unlock 右払い combined with 接続/開放 (also the half-thickness mentioned above) in 曲線/複曲線. see 华文中宋 亪.
though i called it "half", it may be in fact like 1/3.